Last week I visited Berat for three nights. 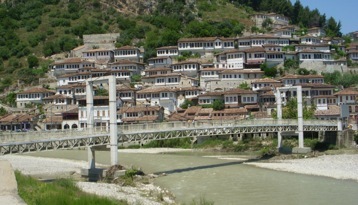 Berat is a World Heritage town and dates back to 314 BCE. The steep long hill up to the castle will test the lethargic traveler, yet starting off in the morning after a raw food breakfast the cobble stone road up to the castle is viable. Arriving by bus after the long trip from Sardana, an older guy approached me and showed me a small booklet with a message of six different languages about his available rooms. For only 10 Euro and “breakfast” the place was great.